Neville Cardus memorably described Mahler's Fifth Symphony as 'one of the seven wonders of the musical world'. From this it can be taken that any performance by a top class orchestra and conductor will reveal insights into this wonderful and wide-ranging score. Thus it proves here, and the Swedish Radio Symphony Orchestra prove themselves comparable with the most distinguished ensembles in this repertoire, matching for example the Mahlerian pedigrees of the Vienna Philharmonic, the New York Philharmonic or the Concertgebouw. There are plans to record the complete Mahler symphonies, and the recent issue of the Ninth suggested it would be a compelling project. An interesting feature of the artwork for this issue of Symphony No. 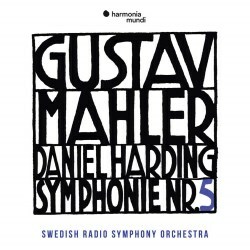 5 is that the lettering on the CD cover is modelled on that of Mahler's grave at the Grinzing Cemetery in Vienna. The opening trumpet fanfare is impressive indeed, not least for the way in which the crescendo builds until the orchestra follows the fanfare with the utmost force. The chosen tempo is relatively slow, and the intensity brought by the lamenting strings of the funeral march becomes the natural foil to the initial expressionist crisis implied by the trumpet's fate motif and the full orchestra's powerful response. The recording plays its full part too, since it proves particularly effective in projecting these characteristics. The various contrasting sections develop in Harding's hands with all the required tumult and anguish, while the more inward moments are captured too, not least the concluding pizzicato. The second movement, marked 'With the utmost vehemence', continues the insistence of this intensity, as it must, until in the later stages Harding builds the special concentration which generates a climax and releases a foretaste of what will be the clinching chorale of the finale. The ebb and flow of tension and relaxation are particularly well handled in this movement, which evolves with a greater sense of momentum than its predecessor. The central Scherzo has a tempo which allows the rhythm to make its emphasis, just as Mahler insisted it should. The Swedish horns are given a special focus here, while the orchestral ensemble as a whole shows great virtuosity, particularly when the percussion section add their contributions so effectively. One strongly rhythmic passage, however, proves something of a disappointment, when the emphatic insistence of the whip is underpowered and recessed in the balance. Whether this is down to the recording or the choice of the conductor is difficult to tell. As the music moves to its final climax in the coda, the sound remains clear amid the complex textures, for which all credit to the recording team, since Mahler's orchestration does not exactly make things easy for them. The Adagietto for strings and harp, associated with Mahler's love for his young wife Alma, is sensitively shaped and expressively poignant, with some highly effective shadings of dynamic. Out of this the Rondo-finale emerges brightly, with its bouncing rhythms and lively principal theme, all enhanced by fine playing that is beautifully captured in both detail and atmosphere. The symphonic momentum and cohesive flow of the music are intensively and compellingly delivered, until the release of the full glory of the brass chorale (with its subtle links back to movement two), brings the symphony to its logical and triumphant conclusion. This closing phase holds many challenges for conductors and orchestras. On the obvious level of virtuosity and momentum, Harding and his orchestra are magnificent, as are most others too. Ultimately however, they - like most others - do not quite achieve that special spirituality which derives from the balancing of the ecstatic violins against the phrasing of the final appearance of the brass chorale. It seems to me that here, at this special moment of judgement and fulfilment, Barbirolli's EMI recording remains without peer.